I feel sick,” I said to my mother, also a flight attendant, as we sped down the highway. Each mile brought us closer and closer to the training facility. I always do just fine. I’ve had thirteen years of just fine. Even so, I still felt sick. “Think you can slow down!” I exclaimed as I glanced at the speedometer. We were going way too fast! Okay fine, so we were only ten, maybe five, miles over the speed limit, but that’s too fast for a person who doesn’t want to be where they have to be any sooner than they have to be there. Did I happen to mention I felt sick? It was that bad. Luckily for me, the airline training facility is located in the same city (and state) that my parents live in, which makes it convenient when I have to bring the kid along with me because the husband is traveling out of the country for work. Normally I’d fly in and out of town as quickly as possible, but since I had to bring along the kid, and the husband was out of town, and the family lived nearby, I decided to make it a week long mini vacation. Only the word vacation and training do not belong in the same sentence. I don’t know what it is about recurrent training that makes me feel this way, but every month of August is spent dreading these two inevitable days. In fact, I don’t know a flight attendant out there who doesn’t get all worked up before entering the big building where it all began. Which makes me wonder, what the heck did they do to us during those initial seven and a half weeks of training thirteen years ago? Seriously. I looked out the window at the the big building looming before us. “I don’t know about great,’ I said, and as I said this I could feel my heart beating, and my palms were sweating, as I kissed my sleeping son goodbye, grabbed my flight manual, and slowly walked up the stairs. One. Step. At. A. Time. Class didn’t start for another ten minutes, so there was no rush to get inside now was there? Yep! I’m with you on that one. 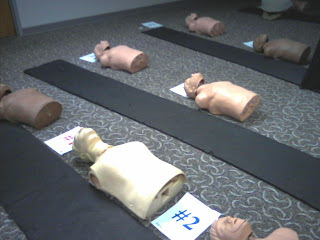 I HATE recurrent training with a passion … It’s a bit ironic as I teach it as well. As a trainer, I love it, as a trainee I hate it! First, I have to say that I love your blog. You are hysterical! Second, I am a FA for a regional airline, I have recurrent in October and just the thought of it puts my stomach in knots. I completely agree! Here is how to reduce stress for recurrent. So don’t get yourself all meshuggah prior to trianing. Have a nosh, and relax! And if it all goes farkakt? Feh! Call your union and they’ll do you a mitzvah. Too funny about converting to Judiasm. I kind of looked forward to recurrent like I do to Yom Kippur… Thank goodness both are only once a year! So I did a sneaky. I just didn’t mention it and prayed that morning sickness wouldn’t kick in while “evacuating” my door in the mock-up…or worse! Oh and …I haven’t converted. But I like the temple. And there you have it.